Plug it in, add water, and let technology tend to this indoor garden. It's one thing to eat local. It's another entirely for food to sprout within arm's length of your dining table. Cue the Smart Garden. 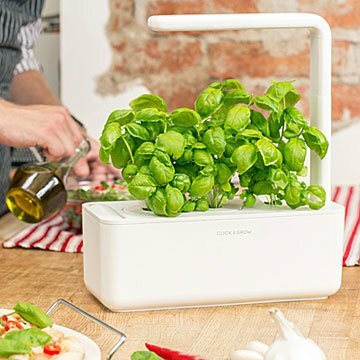 Perfect for the locavore who lacks either a green thumb or a plot of ground, this intelligent indoor device yields fresh fruits and herbs in just three simple steps: plug in, insert pre-seeded plant capsules, and add water once a month. From there, technology takes over. The NASA-inspired soil delivers plant-specific amounts of oxygen, nutrients, and water, while an energy-efficient LED system gives your budding crops an exact dose of direct light. The biodegradable capsules contain no pesticides, hormones, or harmful chemicals, so the only thing you need to worry about is which recipe will best bring out the flavors of your homegrown harvest. Initially comes with three basil capsules. Only one type of seed can be grown at a time, and refills are sold separately. Made in Estonia. Garden water tank is dishwasher safe. Remove LED lamp before washing and spot clean separately. Refill options include: parsley, wild strawberry, basil, and mini tomato. Each refill contains 3 seed and soil capsules. To plant, simply insert the capsules into the garden, fill the tank with water, plug in your garden and watch your seedlings sprout and grow! My daughter loves to grow things but lives where there is limited space and light. This will be perfect for her green thumb! This is so easy and really fun to watch the herbs grow. I definitely plan to purchase more refills of different varieties.